I've been using Ghost to run my blog for a few months now. One thing that was not immediately obvious to me was how to backup the content in my blog. So here is a quick recap on how its done. From here you can see the Export button, which exports your blog is a Ghost blog custom json format. Its basically that easy. This is also where you can import the backup back in again, or any other import from WordPress or wherever. This is also where you can wipe out all the posts in your blog, so be careful. 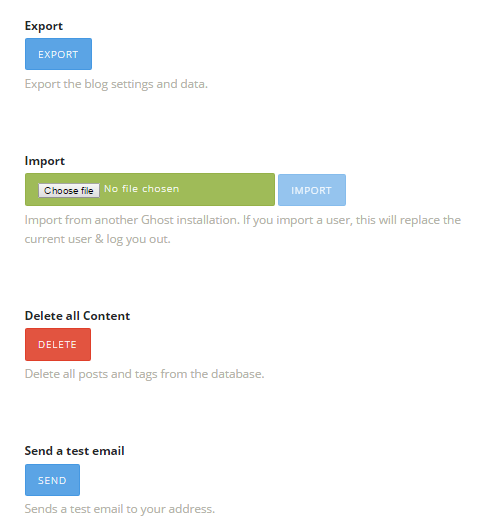 As I said, it appears the debug page is not discoverable, so I hope this helps others looking for how to export backups of their blogs on ghost as well. The only gotcha, you do have to be logged in. Another not very discoverable feature, but if you go to https://[YourBlogDomain]/ghost, it will give you the login page. Then you will have no trouble when you head to https://[YourBlogDomain]/ghost/debug. Thanks goes to this forum post for showing how its done.